About halfway through our trip to the Detroit Zoo, we all started getting a little hungry. It just so worked out that we were leaving the Arctic Ring of Life Exhibit at about this time and whad’ya know, there happened to be a restaurant right in front of us. 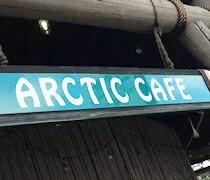 The Arctic Cafe is one of two cafeteria style restaurants at the Detroit Zoo. 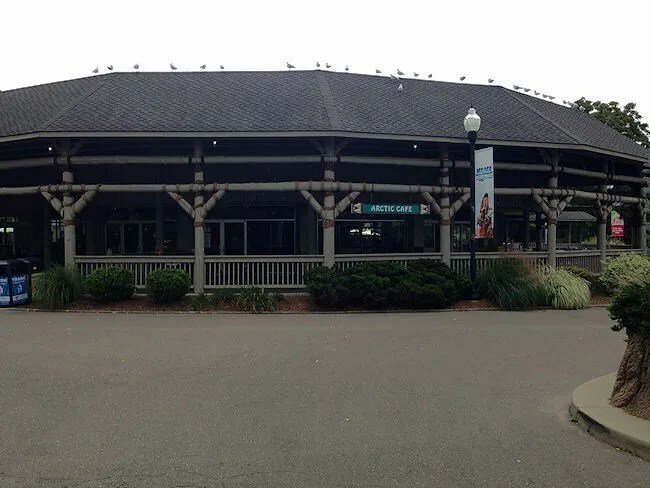 The setup is pretty similar to Beulah’s Restaurant at Binder Park Zoo in Battle Creek. What makes it unique…and by unique I mean unique to any cafe in a zoo across the country, is that the Arctic Cafe is Green Certified by the Green Restaurant Association. 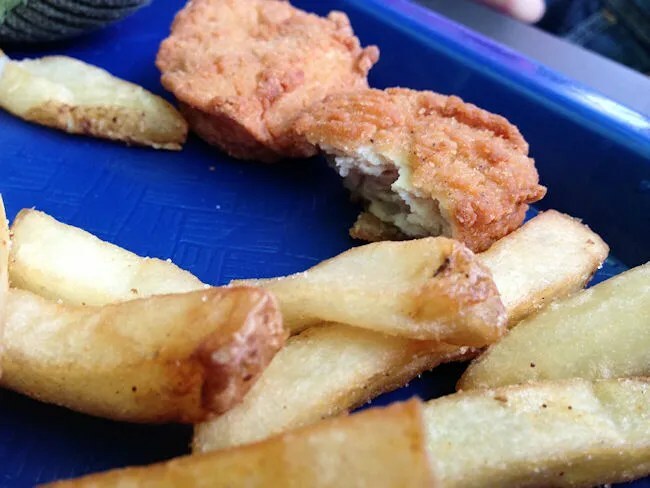 The large restaurant can be divided in to two lines on busy days, but since it was a Monday after school was back in session, there was only one service line open. The food is all pretty simple. 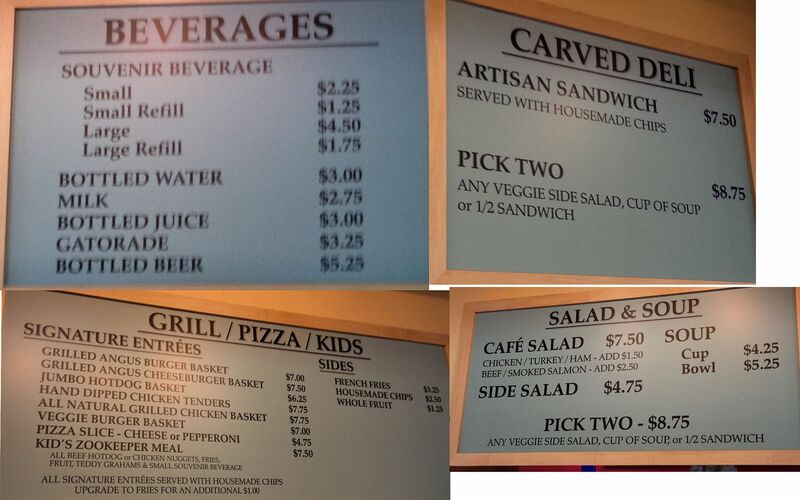 They have burgers, pizza, salads, some chicken and vegetarian options, and of course, meals for the kids. 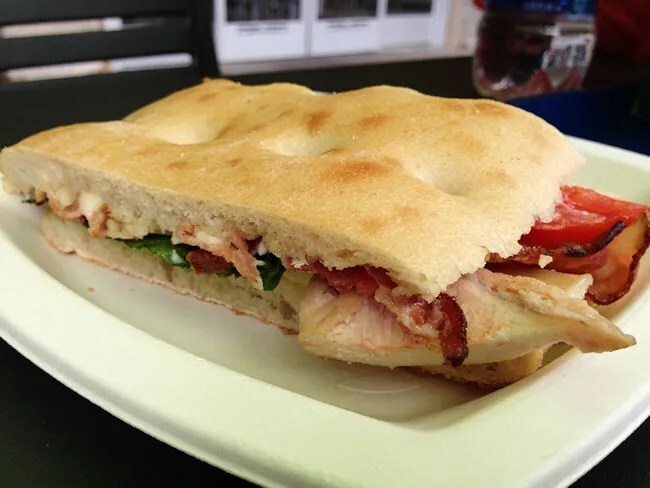 J was intrigued by the Artisan Sandwich from the Carved Deli. These sandwiches are made somewhat fresh. They’re not quite made to order. The sandwich is made on a large submarine-esque bun then it’s cut in to smaller pieces. They don’t cut until you order it though, so it gives you the feeling of being fresh carved. The sandwich comes with chips, but you can upgrade to fries. J passed on the chips and ended up passing on the fries as well. Not sure if she forgot or just didn’t want them. I headed over to the grill section and ordered myself a Grilled Angus Cheeseburger basket. The sandwich is put together like a McDonalds burger. It’s assemble fresh to order, but everything is in warming trays waiting to be put on a bun. I passed on condiments and just got it plain. The basket comes with fries. For L, we ordered the Kid’s Zookeeper Meal. The option of an all beef hotdog or chicken nuggets is offered to go along with fries, fruit, teddy grahams, and a small souvenir cup drink. After we had all of the food on a tray, we added a large souvenir cup Pepsi for me and headed to the cashier. The total was $31 which is awfully expensive for what the food is, but in the middle of the zoo, there aren’t a whole lot of options. We chose to eat outside on the patio because it was such a nice day. L wanted to sit in a chair like a big girl and drink from her souvenir cup, so once we got her settled, J and I were able to dig in to our meals. 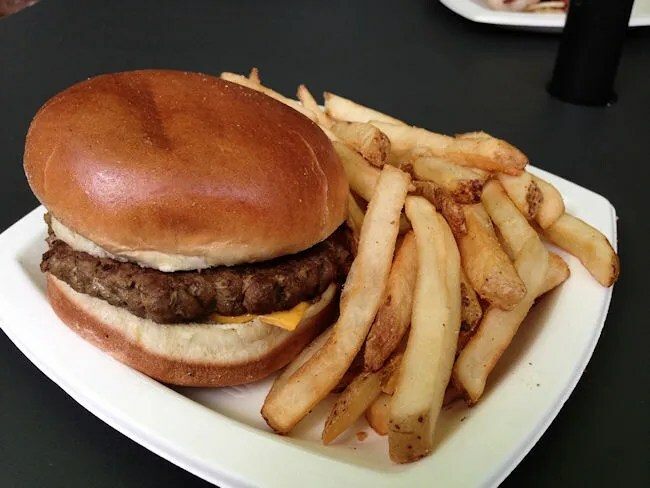 My burger wasn’t much more than a frozen hamburger patty with a slice of cold cheese added on after it was put on the bun. It was good, but nothing special . The big draw was that it was quick. The fries were actually pretty good. They were a little cold because, again, they were just sitting there waiting for someone to order them, but they were skin on fries with a perfect dusting of salt. J’s sandwich was a thin layer of turkey, bacon, tomato, lettuce, and mayo. If she had a choice, she would have gotten the sandwich without the mayo, but other than that, she said it was delicious and a good alternative to the fried food she probably would have ordered. L, of course, liked her fries more than anything. She got the same skin on fries that I got and that’s all she wanted to eat. I ended up eating one of her nuggets trying to get her to try them and I think J did the same. They were pretty standard frozen chicken nuggets. Good, but nothing spectacular. The Arctic Cafe does it’s job of getting food in your belly and getting you back out in to the zoo. The food is better than the typical greasy stuff you expect at places like zoo’s, but it is on the pricey. Your paying a premium for the location and the convenience, but on the whole, it’s pretty decent food. Your’s don’t looked bad and J’s looks real good better than I seen at a zoo or amusement park! Not too bad…just a little expensive for what you’re actually getting.